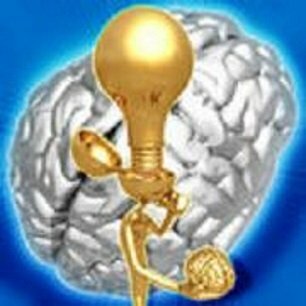 And so you are thinking...stock market trading psychology, what on earth are you talking about? Well, the stock market can be a very hard game. Knowledge of stock market trading psychology is not only a definite asset to be successful in the game, but it is the most important aspect of the game. "Financial intelligence is 90% Emotional IQ and 10% Technical IQ. What determines what we do and who we are, is how we individually respond to our emotions". "We don't trade stocks, we trade people"
"Investment success requires internal control more than any other factor. This is the first step toward trading success. People who dedicate themselves to developing that control are the ones who will ultimately succeed". Unfortunately, stock trading often appeals to gamblers and impulsive people. If you trade for the excitement, you are liable to make trades with bad odds and accept unnecessary risks. The markets are unforgiving, and emotional trading always results in losses. Gamblers have a poor stock market trading psychology. Gamblers feel happy when trades go in their favor. They feel terrible when they lose. While a successful stock trader professional will focus on long-term plans and do not get particularly upset or excited in the process of trading. Theirs is one of sound mind investing. "After practicing psychiatry for many years, I became convinced that most failures in life are due to self-sabotage. We fail in our professional, personal and business affairs not because of stupidity or incompetence, but to fulfill an unconscious wish to fail." You need to be aware of your tendency to sabotage yourself. Stop blaming your losses on bad luck or on others, and take responsibility for the results. This is proper stock trading psychology. Start keeping a diary - a record of all your trades, with reasons for entering and exiting them. Look for repetitive patterns of success and failure. Those who do not learn from the past are condemned to repeat it. Your feelings have an immediate impact on your trading account. You may have an incredible trading system, but if you FEEL frightened, arrogant, or upset, your account is sure to suffer. When you recognize that a gambler's high or fear is clouding your mind, STOP TRADING! Your success or failure as a trader depends on controlling your emotions. One of the best books ever written on stock market trading psychology, is called Trading In The Zone by Mark Douglas. The content of the book addresses the psychological attitude that is an absolute must to becoming a competent and consistent stock trader. From the basic explanation of why we do to defining the problems and finally showing what action you need to take in order to set you on the path to confident trading at the mental level. When you trade in the stock market, you will be competing against the brightest minds in the world. The field on which you compete has been tilted to ensure your failure. If you allow your emotions to interfere with your trading, the battle is over before it has begun. Having a good stock trading system is not enough. Most Traders with good systems wash out of the markets because psychologically they are not prepared to win. They do not have the proper stock market trading psychology mindset. Most amateurs will feel like geniuses after a winning streak. Traders gain some knowledge, they win, their emotions kick in, and they self-destruct. They give back all their profits to the markets. Profits make traders feel powerful and give them an emotional high. They try to get high again, put on reckless trades, and give back their profits. Many stock traders cannot stand the pain of a string of severe losses. They die as traders after hitting rock bottom. You may have to devote as much energy to analyzing yourself as you do to analyzing the markets. The few surviving traders realize that the main trouble is not with their methods, the trouble is with their thinking. They, and you, can change and become a successful stock trader, but you must develop your stock market trading psychology. Losers feel the urge to trade, just as alcoholics feel the urge to drink. They make impulsive trades, go on trading binges, and try to trade their way out of a hole. A loser is like an alcoholic who does not want to know how many ounces of liquor he drank. You have to change how you think in order to stop losing and begin your recovery as a trader. An alcoholic needs to admit that he cannot control his drinking. A stock trader needs to admit that he cannot control his losses. He needs to admit that he has a psychological problem with losses and needs to develop the proper stock market traders psychology mindset. 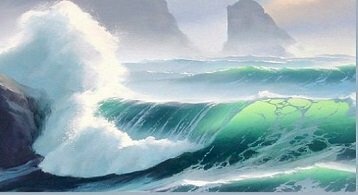 The stock market is like the ocean - it moves up and down regardless of what you want. Your success and failure depends on your thoughts and feelings. It depends on your attitudes toward profit and risk, fear and greed, and how you handle the excitement of trading and risk. To be a winner in the stock market, you must know yourself and act calmly and responsibly. The stock market does not know you exist. You can do nothing to influence it. You can only control your behaviors. This is all part of having the correct stock market trading psychology. A sailor cannot control the ocean, but he can control himself. He studies currents and weather patterns. He learns safe sailing techniques and gains experience. He knows when to sail and when to stay in the harbor. A successful sailor uses his intelligence. A professional trader uses his head and stays calm. Only amateurs become excited or depressed because of their trades. 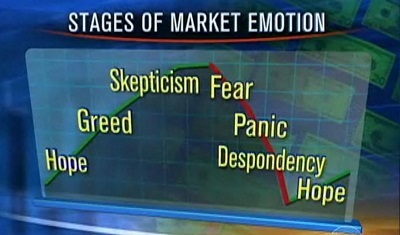 Emotional reactions are a luxury that you cannot afford in the stock markets. Acting out of anger, fear, or elation destroys your chance of success. You have to analyze your behavior instead of acting out on your feelings. This is sound mind investing. A wonderful tool that is available to help you with your stock trading mindset is the Psychology of Trading Series. This was developed by internationally renown stock trading coach Dr. Van K. Tharp. 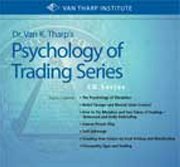 This eight-part audio series includes interviews conducted by Dr. Tharp on topics such as discipline, mental state control, daily debriefing and many other important discussions that affect a trader's personal psychology. This is powerful information that will help you develop you stock traders mindset. Develop the Confidence, Discipline, and Winning Attitude That it Takes to Master the Stock Market! Return from "Stock Market Trading Psychology" to the Home Page: "Stock Market For Beginners"